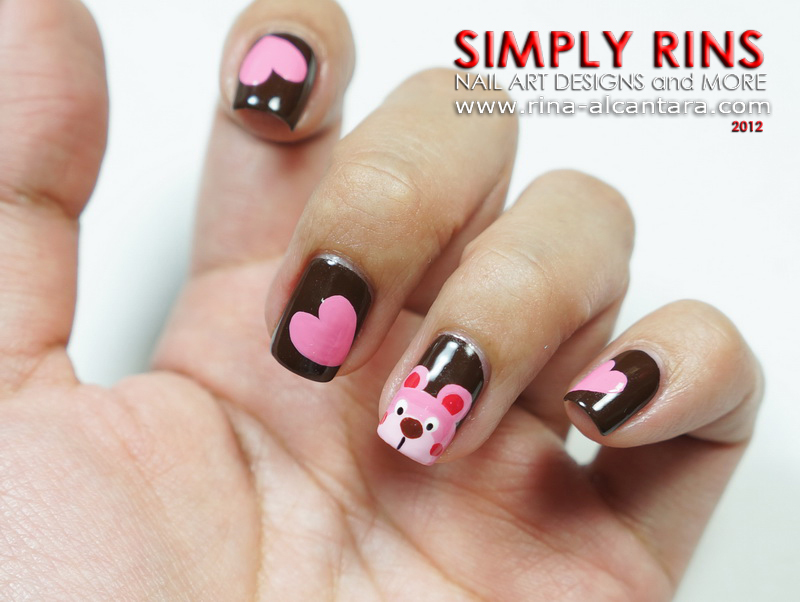 For my last Valentine's inspired nail art, I decided to go for something "cutesy". I chose to wear a deep brown polish for the weekend but I didn't know what design yet. But last night, my mom asked me to paint roses on her nails and she mentioned that pink would look good on my newly polished nails. So when I got back to my personal nail station, I started to think about pink. Surprisingly, bears came to mind. Then I got this idea of painting a bear couple! Yes, I painted a pink bear and a blue bear, a girl and a boy represented by color. I patterned my teddy bears to the previous one that I did, that you can view here. Base color is 2 coats of China Glaze Ingrid. Fabulous color and is a possible 1 coater polish. It's a deep chocolate brown that has a very shiny finish even without a top coat. Application is smooth and easy. I'd say it's a good choice to bring light colors to life like pink and light blue. I decided that the pink bear belongs on my left hand and the blue one on my right. Initially, I wanted to paint them on 2 nails that are beside each other. But I wanted to paint big hearts on the others nails so I decided on having accent nails instead. I also was able to create a video tutorial on how I painted the teddy bears. Perhaps this video can address those who requested an actual footage of how I paint designs on my nails. I also have some good news. I have been meaning to upload a video on how I paint with my non-dominant hand. I finally was able to come up with a decent recording and I'll be sharing it with you on my next post. I know that I have promised this a long time ago and I really had a hard time coming up with a good video. I hope it will be helpful to those who have asked me how I paint with my weaker hand. Stay tuned! Don't miss any of the updates! 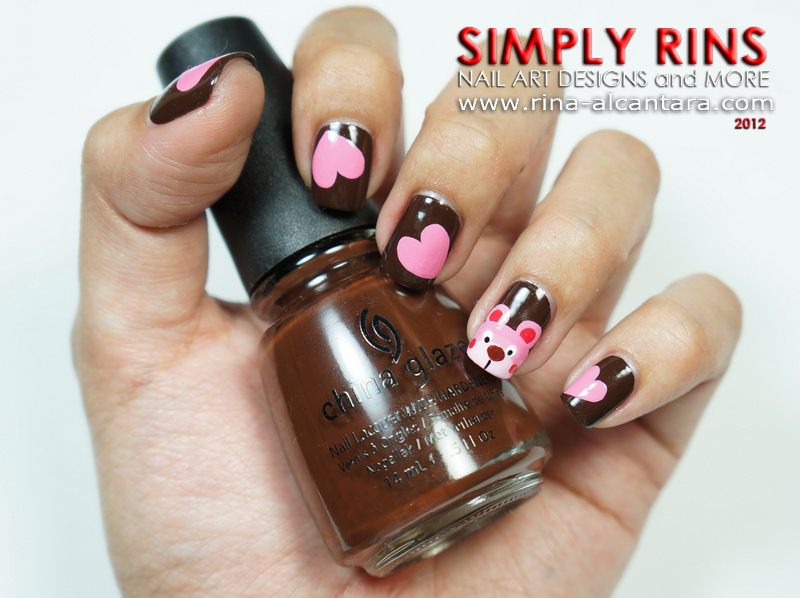 Subscribe to Simply Rins and be notified of new nail designs and tutorials. So adorable, as always! :) This reminds me of Blue & Magenta from Blue's Clues!! So cute. You always do such great work. Truly inspiring. I love them, Rina! Could you please tell me how you mixed the bright turquoise with acrylic paint? My turquoise always comes out dusty, I guess it's because I don't have colors bright enough to begin with. As a reference, I'm using the 14 piece acrylic set from BPS. wow!!! bears have turned out soo sweet! wish U a happy valentines day!! ms. rina where do you buy your nail polish? If in a department store, I go to PCX and Rustan's. Those are absolutely adorable! You are SO talented!